It is freezing outside! Below 30F here in NYC and I can’t think of anything better to keep me warm than Glühwein, a German-style mulled wine. One of my favorite recipes of 2011, see the original recipe with updated images below. Christkindl markets, or German Christmas markets, are street markets with various stalls celebrating Christmas time. Glühwein, literally “glow wine” or German mulled wine, is served at special stands at Christkindl markets throughout Germany and Austria. 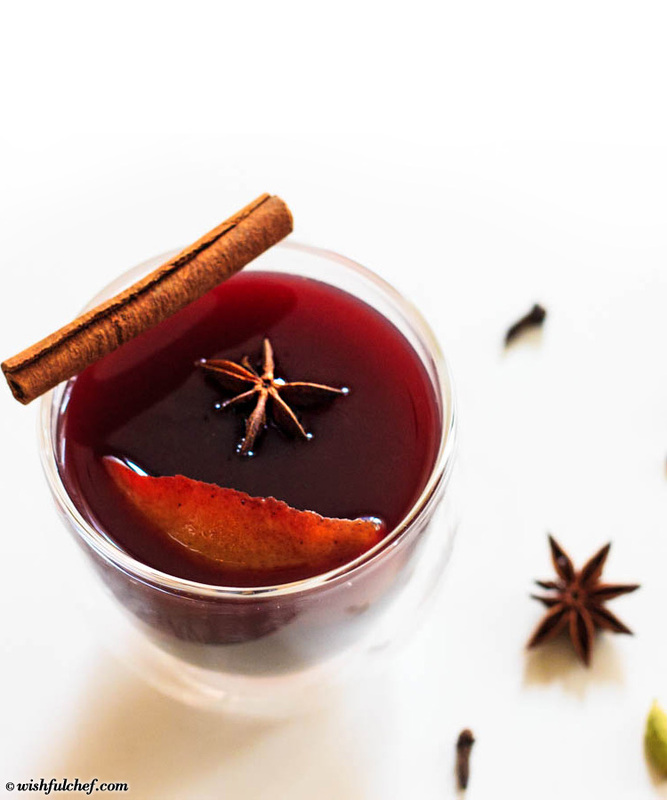 Mulled wine is a traditional warm beverage combined with different spices, red wine, citrus fruits and sugar. It fills your house with a wonderful aroma and warms you up on a cold winter night. Serve this festive drink during your holiday party! For the wine, I used a Cabernet Franc, but any dry red wine should work just fine. I first made a sweet syrup using citrus fruits, spices like cloves, cinnamon and a vanilla bean. This way the flavors can infuse without burning off the alcohol of which is added towards the end instead. 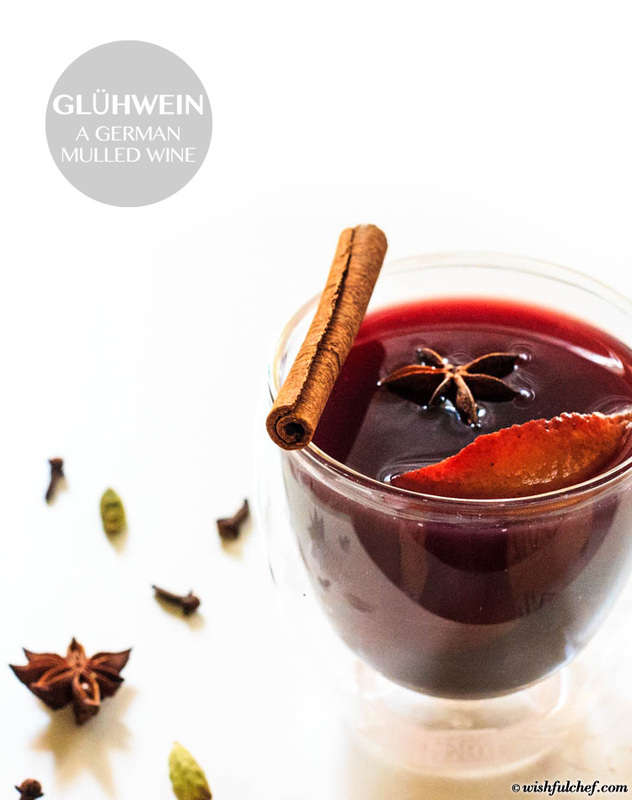 Depending on how strong you want your Glühwein, add liquor like rum or brandy along with the wine. For a lighter version you can also add the wine earlier along with all the spices. 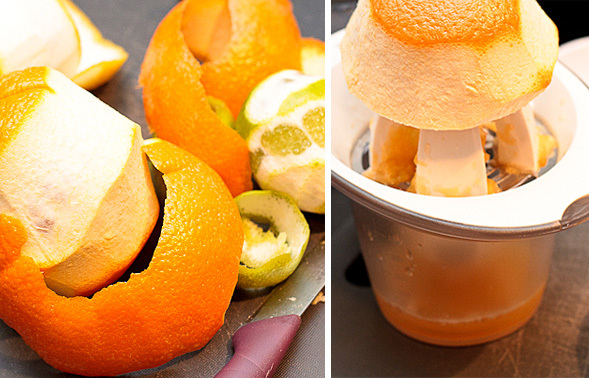 Peel large sections of orange, lemon and lime, then juice the orange. Simmer orange juice, water, citrus peels, sugar and spices for up to an hour. Add in bottle of wine and rum or brandy. Peel large sections of skin from orange, lemon and lime. Over medium heat in a medium sized pot, pour in agave syrup and water, then add the peels and juice of the orange. Add the vanilla bean, cloves, star anise, cinnamon stick, and nutmeg gratings. Bring to a boil, then simmer for about an hour. The liquid will reduce, so after around 30 minutes, add in about a half cup of wine. This allows the flavors to infuse and will create a syrup. 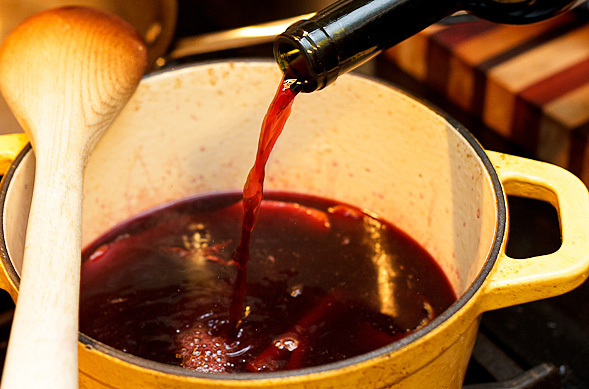 When your syrup is ready turn the heat down to low and pour in the bottle of wine and brandy. Bring back to a gentle simmer and heat for about 5 minutes or depending on how much alcohol you want to burn off you can simmer a bit longer. Ladle it into glasses and serve warm. Silly memory, several years ago when I was an older teenager, I knocked over a bottle of wine in our laundry room (wine rack is in there). Of course, it broke and spilled all over. Mom helped me clean it up but the reason I remember is it smelled SO good. A couple years ago, I spotted the same bottle in the liquor store. As you prob ably guessed, it was Glühwein. Snatched that right up and I’ve been in love since. It warms you so nicely and the wine just smells like the holidays somehow. What a great memory of Glühwein 🙂 Even if its silly, it’s those little moments you remember. Thank you for sharing, Stephanie! And you definitely should try making it yourself because the aroma it exudes in your house is so wonderful. I’m going to try this for my Christmas party tomorrow. Would you double all of the recipe if you want to have two bottles worth of wine? Hi Abbey – Yes, just double the ingredients and it should definitely work. Make sure you use a large pot. At the end, depending on how sweet you want it you may want to adjust and put in more sugar or for strength add more or less brandy or rum. Enjoy your Christmas party! I usually make my mothers recipe but I’ll try adding some vanilla the nexttime that sounds tasty. Yes they do 🙂 Actually leaving soon for Germany, can’t wait to have some! This was absolutely delicious. I didn’t cook it quite as long as it says, but it tasted just the way it did at the German christmas market! Awesome, I’m glad the glühwein turned out well for you! Thanks for the comment, Kate. For how long can you store the left over gluhwein? Hi Ann – You can store in the refrigerator for a day or two, covered, and then just heat it up in a pot or microwave when you’re ready to drink. I made this last night. Sounded good since the weather has turned a little cool for now. It tasted great and made the house smell like I was baking something like a spice cake. This will definitely be a “go-to” cold weather drink in our house! Thanks for sharing the recipe. That’s great to hear Patty! Thinking of making this soon as well since the weather has been getting chilly at night. I’m so happy you enjoyed the glühwein and thanks for your comment! I use apple cider & honey, rather than sugar. It makes a great gift in mason jars with a ribbon & gift tag. I agree, this would be a wonderful gift! Your version sounds great, Sharon. We have a recent egg allergy in the family, and this is going to be the perfect holiday beverage to replace my egg nog. When I was in Switzerland at the Christmas markets, Gluhwein made me so very happy. Any time I drink it now, it takes me right back to the magical, storybook Christmas town. How wonderful, Mel! The same feeling goes for me as well whenever I’m in Germany. I’m actually here now and going to a Christmas market soon…we’ll be drinking some Gluhwein tonight 🙂 Frohe Weihnachten! First time we tried this wss at Berlin Zoo when it was freezing cold back in the 90’s? it lept us warm walking around x we have it every year, tastes nicer than mulled wine,!! 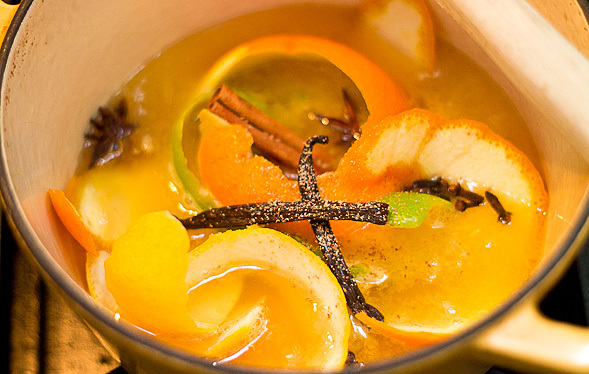 Is the mulled wine recipe the same as the ones served in Belgium during Christmas? I’ve never been to Belgium but I’m sure they make a similar drink. 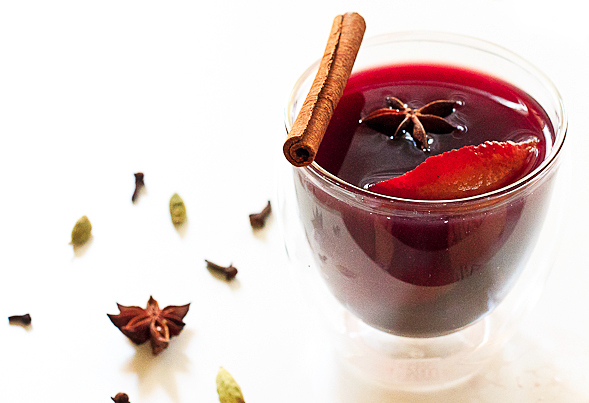 I believe most European countries have special mulled wine recipes during the holidays. I found your recipe last year and made it all winter long. I went to look for it this year on our computer and realized it was on our other computer that was replaced after a lightening storm. So I was in search of finding yours again. The one thing I remembered that was unique from all the others is that you add a 1/2cup wine during the second 30mins to the sugar syrup. You have no idea how happy I was when I found it after searching for several hours. The others just never measured up. My husband was born and raised in Germany so he knows how Gluhwein is suppose to taste. After going to Nuremburg Christmas Market I knew I had to find a recipe that pleases us both. Yours far exceeds all expectations. I now have it bookmarked on ALL of our electronic devices so it doesn’t get lost again. I add about a half cup of Bacardi Rum and increase the sugar to 1cup. We like ours on the sweeter side and add a little to our Black Tea before drinking. My husband says everytime I make it that it’s as great or better than Nuremberg’s and don’t have to travel as far to get it. He LOVES your recipe!!! I tell him it’s because of the spices, vanilla bean and citrus peels that really makes the difference. Truly the best recipe and can’t thank you enough for it making my husband so happy… in so many ways 😉 Now I can’t wait to try the rest of your recipes! 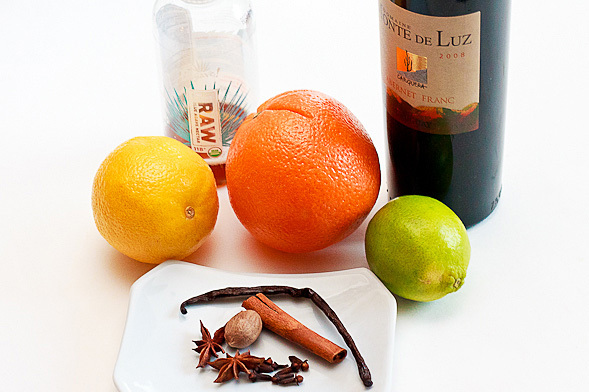 Many thanks for sharing mulled wine recipe, I have founded best stuff on this blog.